Art Squared is a kaleidoscope of artistic creativity, style and colour, featuring the works of Headwaters Arts member artists. Stop by the upstairs working studio of one of the Mill's newest artists, an oil painter, throughout the Weekend of March 29-31 and enter a draw to win a free equine painting! Colour, texture, and form spring to life in the second Headwaters Arts members show of 2019. Mayfield SS Grade 9 Regional Arts students present works inspired by Peony Yip. Shift into the new year with a fresh show of 2 and 3-dimensional works from selected Headwaters Arts members. Join the Grade 12s of Erin District High School for their 2018 exhibition. Discover the abstract artwork of Laura Newton in the Noodle Gallery, you have to see it in person! The annual Christmas Market featuring work by Headwaters Arts artists! Give handcrafted gifts this holiday season. A collection of works by members, presented at the Alton Mill Arts Centre. Rebecca Brianceau is a Toronto-based artist exploring themes at the intersection of ecological health and wanderlust. A solo show of John Adams' spectacular landscapes. Join Headwaters Arts at the Alton Mill, amongst the specatular fall colours, for one of Ontario's most respected annual art shows! A group show of small and wonderful works by member artists. Paintings, photographs and wearable art by Sarah Henry-Godfrey with guest artist Nathan Gatten. A celebration of one of Ontario's traditionalist artists. "I concentrate on seeing the subtleties of what is before me and on drawing them as accurately as possible." An exhibition featuring the striking and exploratory work of two internationally recognized and award-winning photographers, Patty Maher and Robin Macmillan. The works of Julia Gilmore, a farewell exhibition. Mayfield Secondary School presents an exhibition of artwork by grade 12 visual arts students. A member's show featuring all that is Canadian. Original 2 and 3-dimensional works. A senior level art exhibition from Robert F. Hall Secondary School. A new show in the Noodle Gallery featuring the encaustic and cold wax works of Laura Culic, Sandy Middleton, and Ann Shier. From Mayfield Secondary School, an impressive collection of artwork from grade 9 regional art students, illustrating the birds of Kingsport Environmental. The Mill's own studio and ceramic artist Ann Reanderaad presents a celebration of colour, visual texture and imagery in distinctive function pieces and 2-D wall art. An exhibition of works created by architecture and communications technology students from Robert F. Hall Catholic Secondary School. Stunning images by Ellen Cameron and Ryan Pechnick, juxtaposing the raw wild nature of horses natural forces taking over man-made environments. Works by regional artists representing the changing seasons, points of view, and shifting landscapes. A special exhibition in the Falls Gallery, a collaborative effort between CJ Shelton and Caledon East Public School featuring the illustrations of Grades 6, 7, and 8 students. A new show featuring the highly creative, playful, humorous and whimsical work of Rob Croxford, Robin Davis, Dudeman, kukucaju, Bernice Lum, and Eric Allen Montgomery. Two and three-dimensional works depicting the fragments fo life and love from artists across the Headwaters Region. Grade 7 & 8 students from Churchville Public School present an exciting contemporary show in the Falls Gallery, February 14-18, 2018. Mayfield Secondary School presents works by Grade 11 Regional Arts students and inspired by Charlotte Caron, Wednesday, February 7 - Sunday, February 11, 2018. Works showing the interaction of one or more of Headwaters Arts members, to produce a combined effect greater than the sum of their separate parts. A show featuring the works of three photographic image based artists; Joanna Bell, Jessica Lin, and Bryant Serre. A Grade 12 art show from the Erin District High School in the Falls Gallery, January 10 - 14. An eclectic show of paintings by Alton Mill studio artists, in the Falls Gallery. In the Falls Gallery, an exhibition of works created by senior level visual arts students from Robert F. Hall Catholic Secondary School. The North Brampton Watercolour Society returns to the Falls Gallery with an exciting new group show. Headwaters Arts invites you to visit their Christmas Gallery Gift Shop, from November 8, 2017 - January 7, 2018. An exhibition of works to mark the bicentenary of the birth of the founder of the Baha'i Faith. October 25 - 29, with a reception on Sunday the 29th, from 1-4pm, featuring a talk on the significance of art, and its relationship with the spiritual realm. Following the Headwaters Arts Festival Show & Sale, which showcased a Northern landscape panorama in Vander Voet's typical stained-glass inspired style, take in an adventurous solo exhibition of prints, curated by Susan McCrae. Janet Simmons Sweet debuts her 2017 Collection Exposé in Studio 204 September 17, 2017. The exhibit continues until October 29, 2017. One of the most respected art shows in Ontario will open its doors Friday, September 15th - Sunday, October 1st, 2017. The Juried Art Show & Sale features works from over 40 artists across Ontario. Escape into the wonderfully monochromatic and evocative works of John Geeza, in the Headwaters Arts Gallery from August 9 - September 10. Join Headwaters Arts Gallery from July 12 - August 7 for their eclectic show of over 100 – 12″ x 12″ original, 2 and 3-Dimensional works of art by Headwaters Arts members! Headwaters Arts Gallery presents their new show, O Canada, celebrating Canada’s 150 Birthday! This exhibition will showcase Canadian themed two & three dimensional works in various medias. Taking place from June 7 - July 9 with an opening reception on June 10 from 1 - 4pm. Fabulous oil painter, teacher and Mill artist Brenda Loschiavo will have her paintings on display at the Falls Gallery from May 10 - June 4. Her work reflects many hours of plein air painting in Europe and southwest US. Brenda paints and teached out of her Alton Mill studio 213. Headwaters Arts presents "Grounded" the works of talented artists Sonja Mortimer & Ann Randeraad. From May 3 - June 4, experience natures' resilience reflected...reminding the viewer of all the quiet beauty available to us, if only we are still enough to hear and see it. The Falls Gallery is excited to welcome back the Mayfield Secondary School grade 9 students with their new exhibition, The Birds Are Back In Town! Join the young artists and see their fabulous watercolour illustrations of Eddie (the Great Horned Owl), Lady (the Snowy Owl) and Reggie (the Saker Falcon) from Kingsport Environmental. 12 Days on the Road…and more! Roads, maps, and a surprise around every bend! For a landscape painter such as Bonnie Eskelson, road trips (plane trips, train trips…) are addictive! See her wonderful works on display at the Headwaters Arts Gallery from Mar. 29 - April 30. The Falls Gallery is excited to present the works of Mill artist, Julia Vandepolder! Her exhibition, New Paintings From 2016-17, will be on display from March 29 through April 23, 2017. The show features a series of recent small- scaled still life paintings that depict flowers, views from windows and other familiar motifs. The Falls Gallery presents the dynamic works of Mill artist, Joanne Lomas in an exhibition that plays with landscape and the landscape transformed. This exhibition will be on display from March 8 to March 26. Opening reception takes place March 12, 2:00 to 4:00 pm. Join 14 Headwaters Arts members as they share their artistic passion. This fabulous show will be on display at the Headwaters Arts Gallery from Feb. 15th - Mar. 26th with an opening reception on Feb. 18th 1pm - 4pm. The Falls Gallery presents The Last Picture Show featuring artist Wendy & Randy McLeod. Visit the gallery from Feb. 14th - Mar. 5th to see their amazing paintings on wood and wood fine art pieces! Opening reception taking place on Feb. 26th from 2pm - 5pm. The Falls Gallery presents the wonderful paintings of talented Mill artist, Janet Simmons Sweet! Taking place from Jan. 25th - Feb. 13th, White Magic is a collection of Janet's favourite paintings from this "magical" time of the year. The Mill is pleased to present the Erin District High School Grade 12 Art Show All of the Above. The students have created works especially for our Fire & Ice Winter Festival! The class has interpreted the theme “fire and ice” as a reflection on the dualities and complexities of the world we live in. The show will be on display from Jan. 18th - 22nd with a reception on Jan. 22nd from 1-5pm. The Noodle box atmosphere will be switching gears from the whimsy and wonder of the holiday market to the dark and mesmerizing in their next show entitled 'Sense of Chaos'. Featuring the beautiful photographs of D. Bernard Henry​ and the 'organic and morphing' drawing designs of Chris Evitts​ on pottery. A fresh take on art awaits you! Jan. 11th – Feb. 12th, join the Headwaters Arts Gallery as they welcome 18 of their newest members showcasing their artistic visions in the first show of 2017. Please join these artists at the Opening Reception on Saturday, January 14 from 1 – 4 pm. Refreshments served. Headwaters Arts invites you to visit their Christmas Gallery Gift Shop. Original works include paintings, pottery, glass, fibre, photography, jewellery and so much more! This fabulous show is on display from Nov. 16th - Jan. 8th. Opening reception takes place on Saturday, Nov. 19th, 1pm - 4pm. Canadian Landscapes from near and afar! The Falls Gallery presents paintings by local artist Roy Grandy. A love for the outdoors and an explorer’s spirit have inspired the works in this show. The exhibition will be on display from Wednesday, November 16th - Sunday, December 11th, 2017. Artist's reception takes place on Saturday, November 19, 1:00 - 4:00 p.m.
Beginning Nov 9th, the Noodle Gallery in Studio 216 presents "A Conspiracy of Love- Holiday Craft Market." Beautiful work by various artists, fine crafters and authors, including quirky wood paintings, charming stuffed animals (each with their own personality), paintings, fibre art, handmade mittens and even furniture made from reclaimed materials! Copper Fox Design hosts a Holiday Pop Up Shop at the Alton Mill Arts Centre featuring local talented artists to make holiday shopping easy! Taking place in Studio 100, this show is on display until Dec. 31. The North Brampton Watercolour Group will be exhibiting their fantastic work at the Falls Gallery this season. The talented group of professional artists' work will be on display from October 19th - 30th. Opening reception: Saturday, Oct. 22 from 12pm-4pm. Headwaters Arts Gallery presents the quiet elegance of Peter Dusek’s international award-winning Zen-inspired photography. This highly anticipated exhibition, Tranquility, takes place from October 12th - November 13th with an opening reception on Saturday, Oct. 15th from 1-4pm. As a part of the Headwaters Arts Festival, Janet Simmons Sweet debuts her newest body of work - a series of paintings, the Lake Rosseau Collection in Studio 204. This year we are celebrating the 20th Anniversary of the Headwaters Arts Festival! The centrepiece of the Festival is the Juried Art Show and Sale. This prestigious exhibition will run over 3 weeks and 4 weekends. The Noodle Gallery kicks off the fresh Fall season with their brand new show, Transformation and Growth! Featuring the dynamic, colorful, abstract works of artists (and sisters!) Kate Taylor & Helen Utsal. This exciting show will be on display from Friday, Sept. 16th until Sunday, October 30th. The Headwaters Arts Gallery presents “The Best of SOVA” exhibition and sale featuring Southern Ontario Visual Artists such as Robert Chisholm, Lynden Cowen and Margaret Pardy - just to name a few! This show extends from Wednesday, August 17th to Sunday, September 11, with a Meet the Artist reception on Sunday, August 21st from 1 – 4pm. The Falls Gallery's show, "A Retrospective", features the work of extremely talented artist, Dorothy Milne-Eplett. Dorothy is an accomplished painter with several awards and acknowledgements from across Canada, including the National Gallery of Canada and the Canadian Museum of Contemporary Photography. Her show runs from July 27 - August 21. The artist's reception is on Sunday July 30th, 1 - 4 p.m.
Can you feel the heat? Headwaters is heating it up in this newest member show. 'Some Like It Hot!' takes place from Wednesday, July 6th until Sunday, August 14th, 2016. See the show, meet the artists and enjoy refreshments at the opening reception on Saturday, July 9th from 1–4pm! The Noodle gallery presents their summer exhibition of photography, Beats n’ Pieces featuring artists David Bastedo, Susan Holland and Matthew Cassidy! The Bartlett Gallery presents Vice Versa - the coming together of two artists, sharing their interpretation of the human expression, and lack thereof, within the urban, man-made systems. Using paintings and photography to tell a story, artists Delgado and Usquiano explore themes of subtle human expressions in our modern system. Headwaters Arts presents ‘Stoked’ by Ann Randeraad. "Stoked" is one artist's heightened journey through the clay process. Ann will be displaying stoneware, woodfired porcelain and raku at the Headwaters Art Gallery until July 3rd. Featuring Canadian and International art, including original works by some of Canada’s most exciting painters and multi-media artists, The Bartlett Gallery is the perfect place to seek out one-of-a-kind pieces of affordable art! From May 11th – June 5th the Bartlett Gallery will have the wonderful works of the Whitestone Eleven Collective on display. Join the talented artists at their opening reception on Saturday, May 14th from 2-4pm. The Opening Reception will be on Thursday, April 28th from 5-7pm. Kingsport has kindly agreed to bring Eddie the Great Horned Owl to the reception so that guests can meet her! Headwaters Arts presents their latest show, Transformations. Share in the bursting creative energies of art and spring from April 27th-May 29th! Opening reception taking place this Saturday April 30th from 1-4pm. A celebration of all things wood! The 15th annual Made of Wood Show and sale features one of a kind works on wood by artisans from across Canada! With Spring just around the corner, Emilia Perri’s vivacious, textured, abstract paintings are just what art enthusiasts need! Please join Headwaters Arts Gallery from March 23rd to April 24th as we excitedly present Perri’s solo show, Colour & Process. Kids' Artfest is where our future artists can express their creativity! Children can come out and sample the arts, get a taste for painting, drawing and pottery. Headwaters Arts ‘Launches’ An Exhibition Celebrating Gallery Members! New faces, fresh ideas, and innovative art! Please join the Headwaters Arts Gallery from February 17th to March 20th as they welcome 17 of their newest members from 2015 in their group show, Launch. The show will display a diverse selection of two and three dimensional works from these members including painting, fibre, glass and photography. Launch will give the viewer an insightful glimpse into the passion, talent and energy of the Headwaters Artists. Mark your calendars! Visit Headwaters Arts Gallery located in the Alton Mill Arts Centre to see this exciting show! Please join the artists at their opening reception on Saturday, February 20th between 1- 4pm. Light refreshments served. The Noodle Gallery proudly presents their upcoming Winter exhibition, Temporal Vertigo. The dramatic and 'fiery' creations of Eva McCauley and Fraser Forsythe will be on display from Saturday January 23rd until Sunday March 20th. Join us at the opening reception this weekend on Saturday January 23rd from 1pm-4pm. Both Eva and Fraser will be in attendance and would love to meet you! Headwaters Art Gallery is excited to present their first show of 2016, Small Wonders! Located on the main floor of the Alton Mill, this new art exhibition is on from January 6th – February 14th with an opening reception January 9th 1pm-4pm. The show will feature two and three-dimensional works that are 12”x12” in size. All are welcome to attend the opening, enjoy some light refreshments and great art! Reknowned Canadian fashion designer Linda Lundström brings her Designed by Linda Lundström collection to the main floor of the Mill. Located beside Gallery Gemma, Lundstöm's Pop-up Shop will feature coats, vests and shawl collars of genuine suede and fur. Open from Dec. 9 to Dec. 31. Find unique handcrafted gifts by Alton Mill Artists and Guests. Shop small, buy local, and find unique gifts of art this year for the holidays. The artists of the Alton Mill Arts Centre invite you to give the gift of art, with one-of-a-kind works for the one-of-a-kind people in your life. Visit our Christmas markets, and give 'different' this season. One-of-a-kind art trees like you've never seen before! The Alton Mill is geared up for a busy holiday season beginning with our Open House Weekend on Nov. 21/22. All galleries and studios will be open and stocked with giftable goodies. Find that perfect something for your unique someone, and give "different" this year. Christmas in Caledon - Headwaters Arts Christmas show. Headwaters Arts Gallery. November 18 - January 10. Wednesday Nov 11th until Sunday Dec 6th, 2015 Featuring artists Kelly McNeil, Margaret Sarah Pardy, Nancy Ladner and Tracy Smith, 4 Canadian artists working in Oil, Acrylic, Watercolour and scratchboard. A vibrant show of colour and texture reflecting our diverse Canadian Wildlife and spectacular landscapes. Fibre Art by Sonia Jacyk-Bukata. Falls Gallery. Opening Reception: Saturday, October 24, 2:00 - 5:00 p.m. Inspired by the Japanese Boro Coats made from indigio rags used to wrap parcels. I was exctied to use my indigo and shibori dyed remnants, experimenting with other rags and remains I have collected over the years. Each one carries a memory, a feeling, a love, a sorrow. Russna Kaur comments " Walking into the Falls Gallery to see contemporary fiber artist, Sonia Jacyk-Bukata’s show, Remnants Of Memory: Rags & Riches is like stepping into a dream..."
Silk Painters of Ontario present "Seasons" in the Falls Gallery. October 8 - 18. SILK PAINTERS OF ONTARIO currently work out of a space (workshop) at Beaux Arts Brampton. 70 Main Street N. Brampton, Ont. We are limited to 10-12 members to comfortably paint together in one area. Intrigue3: Paintings by Barbara Shaw and Nancy Farrell as well as glassworks by Barbara Bryce in the Bartlett Gallery. October 7 - November 10. Within each artist is a creative force, a fire within that needs to be fed and cared for. Ideas, books, travels, discussions with other artists, courses etc. are all fuel for that fire. Sometimes the flame is almost doused, times when artists are just plain out of energy and ideas. At other times the fire burns so brightly that meals are missed, other jobs are forgotten and the creative fire leads to wonderful works of art. Each artist features one finished piece with pictures showing the progression and evolution of the work to its final stage. The artists in this show are: Darlene Hassall, Marg O'Flanagan-Byerley, Terry Gardener, Linda Jenetti, Margi Taylor, Jackie Warmelink, Freda Wrench, Rosemary Hasner and Rosemary Molesworth. Come enjoy art by artists from all across the Headwaters Region! Kathy Crain, an award winning silk painter and abstract artist showcases her work in the Falls Gallery from September 2- 13, 2015. Meet the artist at her opening reception Sunday, September 5, 1:00 - 3:00 p.m.
Water, wood, rock. Seen in a new light the natural colours and patterns found along the Niagra Escarpment evoke the elemental spirits. Digital textile art by Nancy Sendell. Aug 12th - Sept 13, 2015. Headwaters Arts Member Show June 17 - August 10. Headwaters Arts Gallery. Solace to the Soul /A Walk in the Woods June 17th to July 13th, 2015 Falls Gallery, Alton Mills Arts Centre. Three Letters that Trancend the simpliticy of primary colour by evoking a spectrum of emotion. Featuring potter Ann Randeraad and Janet Simmons Sweet Painter. Mayfield Grade 9 Student Art Show. Mayfield Secondary School grade 9 Students Art Show in the Falls Gallery. April 29 - May 3. The 13th Annual Made of Wood Show returns to the Alton Mill! This one of a kind juried show and sale takes place from April 18 - May 10. Don't miss these one of a kind works in wood from artisans all across Canada. In addition to the juried art show, the Director's invitational show and sale will feature non-competing pieces from woodworkers across the country. Visit the Made of Wood Show website for more details. The Alton Mill Arts Centre presents "This Changes Everything," an art exhibition inspired by an awareness of the effects of climate change on our planet. Interpreting themes presented in Naomi Klein's book of the the same title. Painting and Photographs by Tony Marinus Vander Voet. Headwaters Arts Gallery. March 3 - April 5, 2015. Opening Reception: Saturday, March 7, 2015. 29 textile artists from across Ontario in one show, inspired by the plight of African Grandmothers raising AIDS orphans. Rick colours, textures and images portray the hope felt by these brave women and children. February 11 - 22, 2015. Falls Gallery. Falls Gallery - An exciting exhibition of Fire & Ice themed art featuring the artists of the mill. Each artists has created their own thematic work in their chosen medium and style. Exhibition runs until Sunday, February 8th. Beat the cold winter blues with spectacular art and "steam punk" furniture in the Noodle Gallery during their Winter Exhibition. January 10 - Sunday February 1. Pieces of Me showcasing the best of our best in small format, allowing us to possess a 'piece' of the artist. "Not-your-Run-of-the-Mill Art Show and Shoppe"
Falls Gallery - "Not-so-Run-of-the-Mill" Art Show and Shoppe, Mill Artists Christmas Art Show, November 12 - December 21. Artful treasures for creative types. Santa's best kept secret! "Christmas in Caledon", November 5, 2014 - January 4, 2015, opening reception Sunday, November 30, 12 noon - 3:00 p.m. Most treasures priced under $200.00, nothing over $500.00. Featuring Judy Anderson of kukucaju, Eric Allen Montogmery, and Janet Panabaker - Opening reception November 16, 1-4pm. Show runs Wednesday, October 15 - Sunday, November, 9, 2014. Potter Ann Randeraad displays her work in the Headwaters Arts Gallery. Oct. 8 - Nov 2, 2014. Artists Reception October 11, 2014. "History of the World: Assemblage Boxes"
Janet Simmons Sweet presents her latest oil paintings using the sky as a metaphor for life. The viewer is taken hourly from sunrise to sunset demonstrating diversity and balance. September 24 - October 13. Opening Reception Saturday, September 27, 2 - 5p.m. "The Garden of my Imagination"
A one woman show "The World as Eye See it" by Mill artist Wendy Mcleod. July 8 - August 8 in the Falls Gallery. Summer Exhibition: Julia Gilmore, Katie McLellan, John Leenders. The Noodle Gallery. Works by photographer Melissa Auchincloss - Smith and woodturner Jennifer McKinnon from June 11 - July 6 2014. Robert F. Hall Student Photography Show. June 4 - 8 Robert F Hall Secondary School will be exhibiting photography and art by their graduating grade 12 students. Meet the artists at their opening reception on Wednesday, June 4, 5 - 7 p.m.
May 21 - June 1 Mayfield High school students will hold two art shows in the Falls Gallery. In the first week, grade 9 students will exhibit their works to be followed by grade 12 students in the second. Join us May 22 from 4 - 7pm for the first student reception and May 29 4 -7pm for the second. Awakenings is correct! Spring has sprung and our artist members are showcasing their reactions to the new season and all the wonderful changes it brings. Come and join us at the opening to experience all kinds of 2-D and 3-D artwork from all media and styles, while interacting with the lovely exhibiting artists and the historic Alton Mill Arts Centre building itself. Three artists with very different styles come together in the Noodle Gallery. "Longer Light, exploring the effects of light at dusk and dawn"
Join us in the Paul Morin Gallery for "Longer Light, exploring the effects of light at dusk and dawn", April 12 - May 25. Juried work by Headwaters artists from April 9th - May 4th 2014. The Maple Show in the Falls Gallery. This exhibition features Alton Mill Artists in a show of all things maple, in conjunction with Hills of Headwaters Tourism's "A Taste of Maple" celebration. The show will run to May 19. Rick Mercer once said, “When Mendelson Joe calls, you answer.” At 3pm on Sunday, March 30, the “famous recluse” will literally call in, via videoconference, to The Bartlett Gallery during the opening of a new exhibition of his paintings, Out of the Cage. Joe fans will recognize this as a rare, not to be missed coming “out of the cage” by a man who left Toronto for the woods nearly fifteen years ago. Joe has been called “the quintessential Canadian outsider artist,” and he is famous for portraits that make pointed social commentary, mocking his political foes and revering his friends. Out of the Cage will showcase a softer side of Mendelson Joe, and the northern Ontario landscape that has long been an antidote to his anger. In the north, Joe finds his hope; this is the stuff—the rocks, water and trees—that balm his soul. Of his landscape painting he writes: “Come and witness my heavens.” From March 26 to April 20, The Bartlett Gallery invites you to do just that. This exhibition features new works by painter Susan Ross in the Falls Gallery March 12 - April 30. Reception Saturday March 15, 2-4 pm. Thompson Rivers University Georgian College grads. February 26 - March 23, 2014. “Faces, Places and Spaces”, juried work by Headwaters artists. "Made of Wood Show Preview"
“Made of Wood Show” preview – All things wood! Here’s your chance to preview the 13th annual Made of Wood Show that will be taking place at the Alton Mill from April 26 to May 11. 12 noon to 5 pm. Studios 100 & 101. An exhibition featuring the landscape artists of the mill. Each artist has created their own thematic body of work in their chosen medium and style. January 15 - February 9 in the Falls Gallery. Let's start the new year off with a bang and add a little sparkle and pizazz to the winter doldrums. A pick me up for the New Year! Erin District High School's Grade 12 graduating art students are holding their annual art show in the Falls Gallery January 9 - 12, 2013. Come and meet these talented students at a reception on Sunday, January 12th, 1:00 - 4:00 p.m.
Impressionistic paintings of Fire and Ice by Artist Paul Morin. Coming to the Falls Gallery Dec 6. "Awake" featuring the recent work of fine art photographer pamela Purves. "The Little Art Shoppe" presents a treasure trove of artful ideas from the Alton Mill’s second floor studio artists who have been busily creating for this bountiful season of gift-giving. Juried work by Headwaters Artists to celebrate the holiday season. Year end works from Erin District Highschool students. Working under the auspices of artist Claudia Jean McCabe, 12 artists spent 5 days exploring the possibilities of The Painted Square. Diverse yet convergent, the resulting paintings form a fascinating group, revealing the square as a separate space for experimentation and play. Existing without reference to traditional landscape or portrait dimensions, it’s a liberated place of pure imagination. We look forward to welcoming you to our Artists’ Reception, Sunday November 17th, 1-4pm. Workshop sponsored by Maggiolly Art Supplies, located on Broadway in Orangeville. "Force of Nature" in the Bartlett Gallery. Opening Wednesday November 6, this group show features Floyd Ezinga, Jerre Davidson, Lynne Schumacher, Janny Fraser and Nelson Marques Costa. The show will feature two, and three dimensional works inspired by nature in metal, glass, paint and mixed media. The show will run to Sunday December 1, 2013. Impressionaistic snow paintings by artist Paul Morin. Critical Mass Features the acrylic and mixed media work of eight artists in the Monday Morning Critique group, under the guidance of artist/ Instructor Steve Rose. "Explorations" by Innerscapes featuring artists George Perdue, Tiziana Manierka, Jan Zimmerman, Eileen Simpson and Herta Hajek. October 9 - Nov 3 in the Falls Gallery. Expressive Paintings embrace the simplicity in the candid moments taken for granted and forgotten in between the large events of life by artist Teresa Rodrigues Brownell. Opening Reception: Saturday October 19 in the Bartlett Gallery. A gentle turbulence of manipulated images by photographer and artist Brian Barrer connecting nature and man to stir the viewers imagination. Opening Reception: September 7th, 1-4 in the Bartlett Gallery. Featuring forest and waterscapes from Labrador and Ontario by artist Paul Morin. The Headwaters Arts Gallery marks the opening of its magnificent new space in the Alton Mill Arts Centre with a Grand Gala Opening and Exhibition celebrating the outstanding artists of the Headwaters Region - a juried show featuring the top award-winning and top selling local artists. Headwaters Arts presents an interesting comparisons of the plein air work of three Canadian painters challenged and inspired by the Italian light of the Umbrian landscape and medieval townscape of Montecastello di Vibio. Award winning photographer Maggie Sale displayers her works in the Falls Gallery Aug 14 - Sept 8. Tangled Realities August 7 - Sept 2 Jill Price and Magdolene Dykstra explore human existence and the constant confilct between reality and perception through 3D sculpture and contemporary landscapes. Opening reception: Aug 11. 1-4 in The Bartlett Gallery. August 3rd to September 3. Multifaceted artist Paul Morin returns to his roots with an exhibit of his popular book illustrations. Limited edition print sale over 85% off from August 17 though Sept. 3. Drop in for a rare glimpse into the books with special pricing and deals on signed books from the Artist. The Falls Gallery welcomes the Silver Creek Arts Group from July 16 - August 12. This Artist's collective brings an eclectic mix of styles and content to its second show in the Falls Gallery. Join us July 10 - August 11th in the New Headwaters Arts Gallery for Cuisine Art, a Headwaters Arts invitational show featuring functional pottery, wood and glass vessels, paintings and photos to stimulate your appetite! Figure painter Lynda Clare Grant and photographer, Peter Herlihy use model George AuCoin and his image manipulations to express the inner turmoils of man. Opening Reception: June 15, 1-4pm. Grade 12 Arts Graduates from Robert F. Hall Secondary School exhibit their work in The Falls Gallery Wednesday June 12th to Sunday, June 16th. Featuring works by Artists Jennifer McKinnon, Ann Randeraad and CJ Shelton. Wednesday June 5th - Sunday June 9th for the Erin Highschool Art Grad Showcase. Enjoy works by exciting young artists from the Erin region. Artist Paul Morin explores water and clouds through abstract expression. A Retrospective of works by Craig Bell and longtime Gallery favorites in this, the final exhibition at the Crimson Feather Gallery. Photographers Jeff and Jana Smith display their work May 1st to 26th in the Falls Gallery. Electric, eclectic and energetic - The world as seen by Jy Chiperzak. "Eletric Kool-Aid" On now in the Crimson Feather Gallery. Plus: Additional work by gallery regulars Craig Bell, Yaohua Yan, Elaine Heath, Floyd Elzinga and David Thai, with ceramics by Natalie Prevost, Debra Gibbs and Shu-Chen Cheng. Wood(lands): an Open Call Show by Members of Headwaters Arts. Pastelartist.ca Annual Member's Show April 2nd - April 29th in the Falls Gallery. Highly colourful, abstracted cityscapes barrage the senses with "precise ambiguity." Stocco seeks to illuminate the confusion and excitement that surrounds our urban landscape. Arists Paul Morin explores nature and abstraction in this gallery show. Grad Exhibition - Thompson Rivers University, BC, facilitated by Georgian College Barrie. Join us March 6th until Sunday April 7th in the Dam Gallery for this invitational show by Artists from the Hills of Mulmer. Reception March 16th from 1 - 4 pm. Photo Transitions by Craig Bell at the Crimson Feather. Innovative photographic image transfers created by Craig Bell through both physical and digital manipulation. Select works by painter Greg Hindle and sculptor Nicholas Crombach. Greg’s artwork examines the human condition and explores our constant struggle to dominate the environment. Nicholas' work investigates the relevance of morals with regard to our relationship with animals. Ardent and intense works of Heart and Soul by members of Headwaters Arts. Glassware, Raku, Photography, Painting... Works that have their birth in fire and breathe an icy grace! Don't Miss this unique selection of inspired pieces. Get Ready for All Fired Up! Starting Jan 9th at the Falls Gallery. "Clouds in My Coffee" Featuring the work of Artist Erin Crowley at Crimson Feather Gallery. All our favourite artists come together for this show that features everything but The Kitchen Sink! The exquiste works of photographer Warren Cartwright. Opening Reception Sunday December 2nd at 2pm. An open call members' exhibit. Opening Reception December 1, 1-4pm. Figuratively Speaking features linocut, monotype and collage pieces by Barbara Buntin that blend the human figure with the surrounding landscape. Just in time for Holiday Shopping the Artists of the Alton Mill present The Little Art Show featuring pieces priced perfect for gift giving! See it in the upstairs hallway! Opening Recpetion Saturdy November 17 from 1-4pm. Abstracted features the work of Headwaters Artists Val & John Ashbourne. These two regional artists use unusual media - modern progressions from traditional quilting (Val) and small spare framed wood constructions (John) - to present work which is both challenging but approachable and intriguing but colourful. An open call members exhibit. Opening Reception November 9, 1-4pm. The work of photographers Craig Bell and Erin Crowley are on display in this cloud inspired show. Opening Reception October 27 from 1-4pm. JC Roy is back with new works in Unsinkable at The Bartlett Gallery. Opening Reception October 21 from 1-4pm. The reception will include live entertainment, full catering and JC's new book of Nfld. paintings will available. showcasing recent large format paintings of Paul Morin, including landscapes from Ontario and Labrador. An exhibit of silk painting by Ingrid Sestito, Dianne Sutter, Sandy Graham, Marg Ray, Judith Meeks, Henny Dagenais, Kety Bagwalla, Helen Purvis, Helen Duplassie, Ruth Corteau, Margaret Haynes. A feature exhibition of Doug Brown's work. Opening Reception October 6 from 1-4pm. Dates are as follows: September 21 - Sunday, September 23, 11am - 5 pm and Friday, September 28 - Sunday, September 30, 11am - 5 pm, Reception: Friday, September 14, 5 - 8 pm. An exhibit featuring watercolour scenes of Toronto by Yaohua Yan. Opening Reception Saturday September 22 from 1-4pm. Visit the unique furniture designs and objet d'art of industrial designer David Reale in his inaugural show. Opening Reception September 8 from 1-4pm. New Works by James Gordaneer, Sharon Dembo and George Horan and Duncan Greene. An exhibition featuring the painting of Leonard Jubenville. Opening Reception Saturday August 25, from 1-4pm. Headwaters artists explore the expressive and liberating qualities of Colour! Opening Reception: Saturday, August 25, from 1-4pm. A retrospective of John Laford paintings from the Gordon family collection. Headwater's Arts One-of-a-Kind Show - a fundraiser for the Headwater's Arts Gallery Committee. Opening Reception, August 4 from 1-4pm. A collaboration of works by 8 Mississauga artists ranging from traditional water colours to abstract paintings. W.I.L.D (Wake Induced Lucid Dreams) Join us for a wild journey that will lead you through a dream-like world . Featuring the works of Joshua Smith, Marcelo Suaznabar & Gail Prussky. Opening reception July 21, 1-4pm. The Paul Morin Gallery presents Words with the Shaman, July 14 - September 2nd. Opening reception July 14 from 7-10 pm, which wil include and artist talk and video screening featuring encounters with traditional healers from around the world. The Dam Gallery hosts the Orangeville Camera Club for Beyond the Lens. The show runs from July 4 - July 22, Opening Reception July 7 from 1-4pm. The Mississauga Watercolour Society presents Expressions, a group exhibition featuring nine artists with varying styles bound together by the use of water media. July 1 to August 2 in the Pond Gallery. Come and take your mind off the heat with the Alton Mill tenant artists interpretations of winter. Baby, it's cold outside runs from June 27 to July 16 in the Falls Gallery. A group exhibit presenting an eclectic selection of artists whose styles range from abstract to hyper realism. Some featured artists include: Tyler Fenton-Beckett, Emily Knight, Lynne Schumacher, Annette Kraft van Ermel. Opening reception June 17, 1-4pm. A show featuring the painting of Erin Crowley. Opening reception June 16, 1-4pm. Robert F. Hall's Gr. 12 Photography Class presents PAINTING WITH LIGHT Photography Exhibit. Friday, June 15th. Opening 7:00-9:00pm. Free admission. The Grand Opening Show will be feautring large format waterworks. Join us in the evening of Friday May 25th from 7-10 pm for a reception and screening of new video works featuring original music, provided by Paul Morin and friends. Select works by: Janice Tayler, Aaron rose, Jeanette luchese. Glass by Greg Locke. Spirit of the Moment is an exhibition of 25+ works that depict the fluidity of the human form using three different media: photography, watercolour and sculpture. The show features the work of Iris Casey, Pete Herlihy & Sue Powell. This spectacular show features the work of artist Nigel Dickson along side other Crimson Feather regulars. Opening Reception Saturday May 12th, from 1-3pm. Nesting is a collective display that showcases the work of Alton Mill tenant artists all working around the theme of Nesting. The show opens on Saturday May 5 in the Falls Gallery (studio 212), in conjunction with the Alton Mill's spring event, Spring Awakening. The Alton Mill is pleased to host the works of Tim Murton and Rick Worthington. After an 18-year professional career as a scenic artist creating three dimensional art for top Hollywood films, Tim now devotes his full time to the creation of fine art in his studio in Elora. Tim Murton's painting style ranges from impressionism to photo-realism, but his work is always inspired by the qualities of light. Tim tends towards impressionism. Please join Tim and Rick for a reception Wednesday April 25 at 7:00 pm. Join us for the 11th Annual Made of Wood Show taking place from April 21 to May 13, 2012. This show presents the very finest in woodcraft and art from across the nation. Hosted within the Bartlett Gallery & Crimson Feather Gallery as well as various area of the Alton Mill. Open Call Members Exhibition. Details to come! “Of A Feather” features the extraordinary bird paintings of local artist Laura Kingsbury. Joining Laura are gallery regulars Elaine Heath, Yaohua Yan, Floyd Elzinga and Shu-Chen Cheng. Heath is showing new abstract oil paintings, Yan has three new watercolour paintings, Elzinga is contributing six new Northern Ontario scenes in steel and Cheng shows more of her award-winning Raku ceramics. Opening Reception on Saturday April 7 from 1-3pm. Come out to meet Laura and the other artists! Prior to the offical opening of the Paul Morin Gallery, this show will offer a glimpse of the newly renovated gallery featuring the abstract of nature and the nature of abstract in the art of Paul Morin. Jane Longstaffe, Ann Randeraad & Bridgett Wilson showcase select pieces of their craft in this Fired Up display. From Pottery to Glass Works to Metal Sculpture, this show will entice you. Graduation Exhibition: 2- and 3-dimensional work by Thompson Rivers University, Georgian College Fine Arts Grads, Tyler Fenton-Beckett, Jaclyn Geisberger, Amanda Hashimoto, Sarah Hawley, Elizabeth Hewson, Lindsay Kell, Heather Mcbride, Meaghan Paterson, Katlyn Sumpton, Cory Van Der Vlie. Opening Reception Sunday, March 3, 2012, 1-4pm, Artists Present. Unconventional - features the paintings of guest artist Susan Gale along with work from Crimson Feather regulars Elaine Heath, Craig Bell, Floyd Elzinga, Natalie Prevost and Shu-Chen Cheng. Artists' Reception on Saturday Feb 25, 1-3pm. Passions is an Open Call member's Exhibit. New works form the sought after artist Jean-Claude (JC) Roy. A collection of Colourful and Original works of Newfoundland's vast and diverse landscapes. Opening reception: Sunday February 12th from 1-4 pm. Travel: Physical Destinations, Mental Explorations & Spiritual Journeys. Join the work of Irene Shelton and Silvia Taylor in The Dam Gallery for this wonderful journey. Artists' Reception Saturday January 21st from 1-4pm. After a many-year break from the public eye, Dutch-Canadian painter Huibert Sabelis will be showing his work at the Crimson Feather Gallery. In his book Sabelis' Sympony, author W. van der Beek says "Sabelis always takes the viewer into an imaginary world... searching for paradise lost, heavenly sounds and exotic colours." PLUS: The steel art of Floyd Elizinga, glass by David Thai, abstract B&W photography by Craig Bell and an expanded selection of ceramics including new work by Shu-Chen Cheng and Natalie Prevost. Just in time for the holiday gift giving season, Headwaters Arts' Dam Gallery is pleased to bring you Small Art, Big Ideas . The curatorial criteria specifies 2- and 3-dimensional works no larger than 16" on the longest side. The result is a show of exquisitely rendered, intimate pieces which stand as exemplars of the principal that much can be said with few words. An unusual show, not to be missed and a perfect opportunity to share the gift of fine art with a special person in your life. Opening Artists' Reception: Saturday December 17th from 1-4pm. A diverse exhibit of colourful abstract work in various mediums by Debra Trow, Darlean Morris, Daniel Beirne and Andrea Bird. Opening Reception to be held on Saturday, December 3rd 3- 5pm. Featuring textile artist Alice Vander Vennen. Craig Bell and Elaine Heath elaborate on this theme with pieces that focus on telling a story. A special gift-giving selection of work will be on display by our ceramic artists Debra Gibbs, Jennie Creeggan, Grace Donati, Shu-Chen Cheng and the Barefoot Potter. Winter Solstice in "the Hive"
Join us on Saturday, November 26th for the opening reception and refreshments, and to meet the artists. 1 - 4pm in 'the hive'. Show runs from Nov. 26th until December 18th, 2011. Studio Hours: Nov. 26, 27, Dec. 2, 3, 4, 9, 10, 11, 16, 17, 18th - 10am until 5pm each day. Eight of Headwaters' leading artists: Rosemarie Armstrong, John Ashbourne, Iris Casey, Rose Hasner, Pete Herlihey, Andrea Trace, Steven Volpe and Freda Wrench, bring an intriguing and challenging mix of media and styles to the Dam gallery at the Mill as a last breath of fresh air before the onslaught of the Christmas season. Watercolours by Elaine Heath and Yaohua Yan, photo & mixed media by Craig Bell, bronze sculpture by Hugh Russel. Meet the artists at a reception Saturday Nov 5, 1-3pm. The paintings of Freda Wrench in her show Down to Earth can be seen at the Headwaters Arts Dam Gallery from October 7 - November 8, opening reception October 15 1:00 pm to 4:00 pm. Tony Vander Voet brings his Chile: Impressions After the Storm show to the Pond Gallery from October 5 - October 20, opening reception October 15 from 1:30 - 4:30. James Gordaneer's Oil paintings will be shown in The Bartlett Gallery October 2 to October 29. This show features spectacular works in copper by guest artist Adam Colangelo and the acclaimed Raku ceramics of guest artist Shu-Chen Cheng in addition to watercolours by gallery regular Elaine Heath and an abstract photographic study of trees by gallery regular Craig Bell. Opening reception Saturday September 24 from 1pm - 3pm. The Alton Mill and Headwaters Arts are proud to present an exhibition of large metal artworks in our outdoor sculpture garden, featuring Marlene Hilton Moore, Floyd Elzinga, Yael Erlichman and others. High, Low and In-between - new oils by established painter Peter Adams. Adams' new work reflects a keen sense of his surroundings and cycles of life. Opening reception Sunday September 11 from 1pm - 4pm. Dutch photographer Claudia Duijsens presents a series of magnificent photographs of wild horses taken at the Return to Freedom American Wild Horse Sactuary in Lompoc, California. Watercolour art show and workshops with established Turkish-Canadian artists Asuman and Atanur Dogan. Photography by guest Cagil Atta Dogan. Summer's End features a photographic study of windows by Craig Bell with oils and watercolours by guest artist Doug Geldart, smoke-fired pottery by Natalie Prévost, and watercolours by Elain Heath. 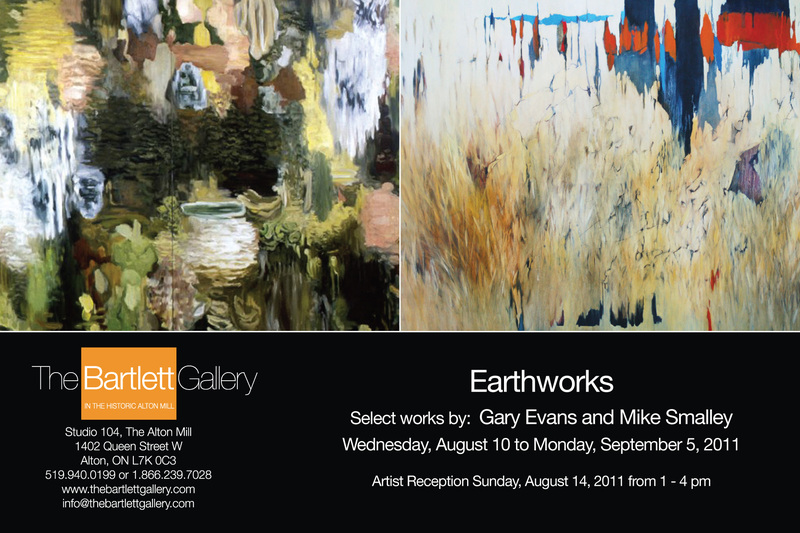 Gary Evans and Mike Smalley are both Abstract Expressionists influenced by their natural, organic environments. Opening Reception: August 13 from 1pm to 4pm, show runs to September 5. The Dam Gallery presents the work of three young artists, Alex Richardson, Julia Vandepolder and Rachel Clark-Hall. Each artist examines the effects of time, transition and transformation while exploring their own unique areas of interest. They contrast and juxtapose the ephemeral and the concrete. Often objects are deconstructed to the point of near abstraction. A complementary colour palette unites the three artists’ work in the exhibition and lends a quiet strength to the overall presentation. You can see and purchase the work of these emerging artists until September 5. The expansive skies in this collection of paintings by Alton Mill artists Bonnie Eskelson and Dawn Friesen evoke their common roots in the Canadian Praries. Watercolours by Elaine Heath, Photography by Craig Bell, glass by David Thai and acrylic paintings by Carmella Casuccio. Artists from galleryELL of NY (Becky Yazdan, Jon Ros, Nancy Hubbard, Kirsten Nash, Joel Bacon, Deanna Lee, Christine Gedeon, Annie Varnot) play off the old industry of NYC/Brooklyn vs. Alton's Textile/Latex Mill in a variety of mixed media. Heritage Caledon and the Alton Mill Gallery present, TIME FRAME, a juried exhibition celebrating Ontario's cultural and natural heritage. Take a little break from the Orangeville Blues and Jazz Festival and come down to the Dam Gallery to dig the visual vibe. We have all kinds of creative riffs on display. Thanks to all those that submitted artwork. We are pleased to announce that the recipient of the Jurors' Choice Award is Paula Tymchuk for her painting titled, Vita Versus I. And again in this exhibition the Gallery Committee is happy to see new artists that are participating in their first HA exhibition. Welcome! Figurative works from 1968 to present in watercolour and mixed media. Headwaters Arts Dam Gallery: "Colours of Passion", open call members exhibition. Feb 16 to March 15. Featuring works from French expressionist colourist painter, Jean Claude Roy, Newfoundland landscape watercolour painter George Horan and Montreal abstract painter Emily Knight. A seasonal celebration of artistic talent! One-of-a-kind art, fine crafts, jewellery and Fair Trade products throughout the holiday season. Ted Fullerton's dramatic scultures are on display throughout the grounds until August 28, 2011. According to Fullerton's artist's statement, these works reflect imagery that is "symbolic and metaphoric by nature, usually associated or interpreted with myth that alludes to dualism or the personification of the force of nature, as well as human nature". Since his career began in the 1970s, Fullerton has exhibited across Canada, England, Australia, Spain and Yugoslavia. Fullerton has completed significant public sculpture commissions and his works are in private, corporate and public collections across Canada and in the United States.He has received numerous awards for his painting, printmaking and sculpture, and has been featured in numerous publications. In the 1990s Fullerton was artist-in-residence at Cape Dorset and at Canadore College and he currently is co-ordinator of the Fine Arts program at Georgian College. This show is a joint presentation of the Alton Mill and Headwaters Arts, who gratefully acknowledge the support of the Ontario Arts Council.